Diamonds naturally come in every colour of the rainbow and has multiple shades. But the best diamonds are considered to be those that appear to be white or translucent. These are the most commonly preferred diamonds for engagement rings.The best colour for a diamond is no colour at all. Diamonds are valued by their nearness to colourlessness – nearer to transparency it is, higher is their value. Though fancy colour diamondswith vivid shades such as pinks, blues, green and yellow are an exception to this case and have a premium price.They are graded at a differentscale from other colourless diamonds. GIA has standardized the most commonly accepted scales to grade diamond colour that range from D to Z grade - from entirely transparent to light yellow ting. These are globally accepted standards. An absolutely colourless diamond allows light to pass through without obstruction, resulting in the dispersion of light into rainbow colours that enhance fire and brilliance. Though it is quite rare to find such absolutely colourless diamond, making them exponentially pricier. Diamonds are formed when coal goes through a transformation due to massive amount of pressure for thousands of years. It is obvious that these rocks retain some properties of the minerals giving them a yellowish or brownish tint. Though after cutting and polishing this is reduced to almost just a faint shades. GIA’s colour-grading scale for diamonds is globally accepted as an industry standard guide. The scale starts with the grade D, indicating the clearest or most translucent diamonds and continues with increasing shades of colour ranging from faint yellow to brownish indicating grade Z. GIA has defined grade with a fixed range of colour tint. Grading is done by comparing the diamond to be graded against "master stones" or GIA certified set of cubic zironia with a defined gradecolour shading. Diamonds are placed face down under either mock or natural light on a pure white background for comparison. Some gemmologist also use a device called “Colorimeter” to determine colour grading. But one can’t deny that there is no substitute for a skilled human eye. Diamonds are graded by assessing their colour from both up and downward angle and finally giving it a grade by comparing the colour to corresponding grade. Following are the grades ranging from D – which is the highest grade to Z – which is the lowest colour grade. They are almost completely colourless or have minute ting of colour that can only be identified by experts. Less that 1% off all diamonds fall under this category. D: This is the highest diamond colour grade with 100% transparency. D graded diamonds are extremely rare and very expensive. They are a symbol of perfection. E:Incredibly beautiful, visually there is negligible amount of yellow shade, invisible to naked eye. Grade “E” has very high colour purity. These too are incredible rare. F: Diamonds with F colour grading portray stunning beauty with only a slight tint, almost unrecognisable to amateur eyes. When compared to D and E, diamonds with F colour grade are equally stunning showing negligible ting of yellowish shade, giving incredible value at lower cost. Diamonds with grade from G to J have only slight tracing of yellow that can be detected by only by trained eyes in normal lighting. Thesediamonds are more popular amongst masses as they are near perfect in most affordable range with only a slight ting that goes almost unnoticed by the naked eye. G – H: They are practically colourless with only a slight trace of colouring, which can be detected by experts. Unless the diamond is compared with a master stone of higher grade, the shade of colouring in these grade is nearly untraceable. H grade shows off slightly more trace of colour than G but an untrained eye can hardly notice the difference. Both grades a most popular as they provide incredible beauty within your means. I – J:These grade diamonds are almost translucent. The negligible amount of colour that they carry is untraceable because of their excellent sparkle. The slight colouring can only be spotted by trained professionals. They are an excellent option for diamond engagement rings giving superior value at less cost. However, be aware while buying a J grade diamonds especially for step cuts. Because of step cut’s characteristic look the colour tint is detected easily. It is best consult a gemmologist before investing. 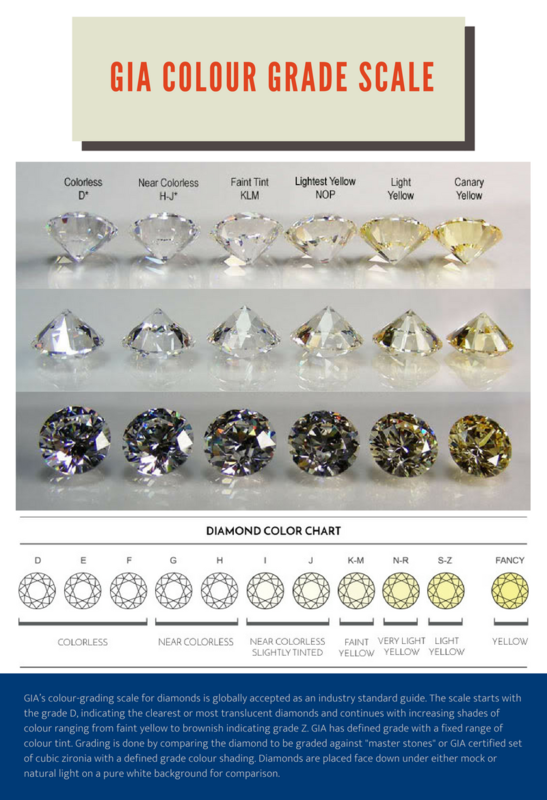 Diamonds under these grades have an increasing shades of faint colouring from yellow to brownish tint which is easily noticeable. Yet some diamonds in this range can be stunning and beautiful. They form almost 40% of all diamonds. K – L: These grades of diamond though shows off a slight tint yet does not compromise the stone’s sparkle. In brilliant cuts like princess and radiant it is even more difficult to notice the faint colour. However if the diamond is of higher carat L colour diamond can look yellow even in normal lighting. Though the changes in the colour might seem insignificant however the pricing between each grade increases exponentially with every higher grade. The price difference with shift in the grade can range from 8 % to 25% particularly with D to J grade. While purchasing a diamond consider all elements to fit in your budget. Because of the diamonds cut, every diamond inherently shows immense sparkle and brilliance. So a slight colouring of lower graded is easily masked. Colour of the metal also has a huge impact on the look of the diamond. Usually higher colour grade diamonds are recommended to pair with white metals like platinum or white gold to enhance its brilliance and highlight the purity. However a lower grade slightly tinted diamonds look even more stunning and white with a yellow or rose gold setting. Choosing a lower cut diamond may show only a slight colour difference but has a huge impact on savings. The most perceptible price difference is from G to F colour grades. Because of its indiscernible shade yet lower cost as compared to the colourless category diamonds, G closely followed by H are the most popular diamond colour grades. Fancy cut diamonds like Marquise, Pear, Oval, Emerald, Radiant or Asscher cut have a tendency to show more because of their unique shapes as compared to Round cut diamond. So if you are planning to buy a fancy shaped diamond you need to buy a grade higher than what you would have considered if it was round cut diamond. Another factor is the carat weight, bigger the diamond more prominent the colour shows so if you are going for a bigger carat you would need to select a higher colour grade. Another important factor that affects a diamond’s color is fluorescence. Wondered why some diamonds still retain sparkle even in the darkness. It’s because of fluorescence. Fluorescence is the diamond’s reaction to UV light i.e. the black light. Traces of some naturally occurring elements, such as Boron causes fluorescence in a diamond that can affect its visual appearance. Fluorescence has a whitening effect, particularly in lower grade diamonds. But in higher grade diamonds the same can cause the diamond to show a grey tint. In lower colour grade i.e. from I to L, we recommend considering Medium or Strong fluorescence to enhance their visual appearance. With the variety of colours grades and multiple other factors, her are a few expert tips to consider while buying a diamond. - For the perfect blend of value and visual appeal, we recommend to look for diamonds within the colour range of G to J. - However for larger carat diamond it is recommended to choose a higher grade as the colour difference is more prominent in larger diamonds. - Prefer a round cut diamond to that of fancy cuts as fancy cut diamonds like pear, marquise, emerald or princess cut shows more colour hence you will have to choose a higher grade. - The metal also immensely affects the look and appeal of a diamond. If your diamond engagement ring is made of yellow gold or rose gold, a low grade coloured diamond looks whiter and stunning as the dark shade of metal brings out the colour. Metals like platinum and white gold tend to show off more colour of the diamond and hence need top grade colourless diamonds. -Diamond setting also matters a lot. A diamond setting like a bezel or channel setting cover majority of diamond and will hide the colour easily. One that showcases more of the diamond like a four prong setting of a solitaire will show more colour and hence require colour grade from D to G.
- Unless you are a trained expert, it is very difficult for a layman to distinguish the colour difference even in excellent lightning. Therefore, don't fret if the colour grade is not perfect. Beside your white diamonds with a ting of yellow to brownish colouring, there are a few fancy coloured diamonds include grey, blue, yellow, orange, red, green, olive, pink, purple, brown, and black. Don’t mistaken them with other gemstones like sapphire, ruby, topaz, emerald. These are diamonds with colouring. These are extremely rare. Red diamonds are the rarest of all and most expensive. Depending on the colour saturation, intensity, and hue of a diamond, colour can either detract from or enhance its value. Amongst these renowned coloured diamonds include cognac, champagne, chocolate, icy and canary. Fancy colors are graded differently from white diamonds. GIA has standardised this process by evaluating the strength of colour and the undertones. Diamonds can have multiple undertones with some dominant shades such as Light Orangish Pink or Fancy Yellowish Green. We recommend consulting a gemmologist or a professional and physically seeing the diamond before purchasing them.